Identity: The Sum of All Parts? 0062. AMRC Collection, Williams Afghan Media Project, Williams College, Williamstown, MA. 0110. AMRC Collection, Williams Afghan Media Project, Williams College, Williamstown, MA. 0185. Khalilullah Enayat Seraj Collection, Williams Afghan Media Project, Williams College, Williamstown, MA. 54-10. AMRC Collection, Williams Afghan Media Project, Williams College, Williamstown, MA. Alvesgaspar. "Fernão Vaz Dourado 1571-1." Digital image. Wikipedia Commons. Accessed September 6, 2010. Blitz-Lexikon, Meyers. "Meyers Blitz-Lexikon Ethnic Groups." Digital image. Wikipedia Commons. Accessed September 6, 2010. http://commons.wikimedia.org/wiki/File:LA2-Blitz-0263.jpg. "British Empire Color." Digital image. Electronic Educational Environment. Accessed September 6, 2010. https://eee.uci.edu/programs/humcore/images/India/British_empire_Color.jpg. Burke, John. Besutee Hazara Chiefs [Hazaras of Besud]. 1879. Courtesy of the British Library Board, London. Burke, John. Kohistani and Hazara Combatants [Kabul]. 1879. Courtesy of the British Library Board, London. In British Library. Accessed September 6, 2010. http://www.bl.uk/onlinegallery/onlineex/apac/photocoll/k/019pho0000430s3u00058000.html. Collet, C. "Four Native American Indians of New France (Canada)." Digital image. America's Story, from America's Library. Accessed September 6, 2010. http://www.americaslibrary.gov/jb/colonial/jb_colonial_deerfld_2_e.html. Dcoetzee. "Wenceslas Hollar - A Peony (State 2)." Digital image. Wikipedia Commons. Accessed September 6, 2010. http://commons.wikimedia.org/wiki/File:Wenceslas_Hollar_-_A_peony_%28State_2%29.jpg. Dcoetzee. "Wenceslas Hollar - Title Page (State 3)." Digital image. Wikipedia Commons. Accessed September 6, 2010. http://commons.wikimedia.org/wiki/File:Wenceslas_Hollar_-_Title_page_%28State_3%29.jpg. Dupree, Nancy. A69-304-C. Dupree Collection, Williams Afghan Media Project, Williams College, Williamstown, MA. Dupree, Nancy. A70-1. Dupree Collection, Williams Afghan Media Project, Williams College, Williamstown, MA. Exter, Buchenwald. "Buchenwald Prisoners 83718." Digital image. Wikipedia Commons. Accessed September 6, 2010. http://commons.wikimedia.org/wiki/File:Buchenwald_Prisoners_83718.jpg. G-00183-35. AMRC Collection, Williams Afghan Media Project, Williams College, Williamstown, MA. H-00220-29. AMRC Collection, Williams Afghan Media Project, Williams College, Williamstown, MA. The Horse in Motion. "Sallie Gardner," Owned by Leland Stanford; Running at a 1:40 Gait over the Palo Alto Track, 19th June 1878. Prints & Photographs Division, The Library of Congress, Washington, DC. Accessed September 6, 2010. http://loc.gov/pictures/resource/cph.3a45870/. Jalali, Jawad, and UNAMA. "Photo of the Day: 29 January 2009." Digital image. UNAMA's Flickr Photostream. Accessed September 6, 2010. http://www.flickr.com/photos/unama/3238604922/in/set-72157612962776233/. KES-934-A-303. Khalilullah Enayat Seraj Collection, Williams Afghan Media Project, Williams College, Williamstown, MA. Koochigirl. AMRC Collection, Williams Afghan Media Project, Williams College, Williamstown, MA. Mackenzie, Donald A. "Myths of Babylonia and Assyria." Digital image. Project Gutenberg. Accessed September 6, 2010. http://www.gutenberg.org/files/16653/16653-h/16653-h.htm. Mahwash. "Mast-O-Ghazalkhan (Drunk With Ghazal)." In Radio Kaboul. Accords Croisés, 2003, CD. Menten, Alexis. Southern Uzbekistan. 2004. Moeller, U.S. Army Sgt. Matthew C. "Breaking down Language Barriers during Operation Silver Creek." Digital image. The U.S. Army's Flickr Photostream.Accessed September 6, 2010. http://www.flickr.com/photos/soldiersmediacenter/3808258896/. Q-00492-17. AMRC Collection, Williams Afghan Media Project, Williams College, Williamstown, MA. Q2-01263-19a. AMRC Collection, Williams Afghan Media Project, Williams College, Williamstown, MA. Rayray. "The Speaking Portrait." Digital image. Wikipedia Commons. Accessed September 6, 2010. http://commons.wikimedia.org/wiki/File:The_speaking_portrait.jpg. "Save Me From My Friends!" In Afghanistan Old Photos. Accessed September 6, 2010. http://www.afghanistan-photos.com/. Sl-00012. AMRC Collection, Williams Afghan Media Project, Williams College, Williamstown, MA. Sl-04273. AMRC Collection, Williams Afghan Media Project, Williams College, Williamstown, MA. Stroop, Jürgen. "Stroop Report - Warsaw Ghetto Uprising 06b." Digital image. Wikipedia Commons. Accessed September 6, 2010. http://en.wikipedia.org/wiki/File:Stroop_Report_-_Warsaw_Ghetto_Uprising_06b.jpg. "Table of Natural History, Cyclopaedia, Volume 2." Digital image. Wikipedia Commons. Accessed September 6, 2010. http://commons.wikimedia.org/wiki/File:Table_of_Natural_History,_Cyclopaedia,_Volume_2.jpg. Thomson, John Turnbull. "ChineseKayTribeStonecutters-Singapore." Digital image. Wikipedia Commons. Accessed September 6, 2010. http://commons.wikimedia.org/wiki/File:ChineseKayTribeStonecutters-Singapore.jpg. "Types of the Chief Living Races of Mankind." Digital image. ImageShack. Accessed September 6, 2010. http://img72.imageshack.us/i/histman3os3.jpg/. UNAMA. "Posters." Digital image. UNAMA's Flickr Photostream. Accessed February 6, 2010. http://www.flickr.com/photos/unama/3715331217/in/set-72157618947457368/. Unknown. Afghan Women. 1895. Courtesy of the British Library Board, London. In British Library. Accessed September 6, 2010. http://www.bl.uk/onlinegallery/onlineex/apac/photocoll/a/019pho000015s10u00030000.html. Of course it doesn’t exist. It’s an optical illusion that shifts, depending on your perspective. And that illusion is drawn and re-drawn, adjusted and erased. But as much as it doesn’t exist, it also does. It shapes the reality of peoples’ lives. In the 19th century, Afghanistan began to emerge as a nation. Russia and British India were exerting pressure on the region, each wanting to forge a buffer state between two empires—a state that would be called Afghanistan. But within this new national identity, there was an endless spectrum of ethnic identities—different groups and tribes that stretched across the region. 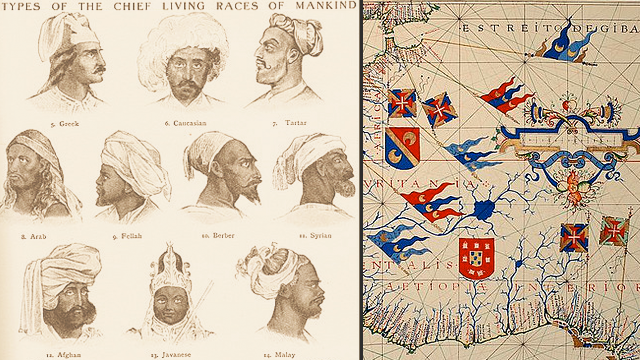 In the 19th century, colonizing powers were obsessed with the concept of nations. They wanted to carve the world into clearly marked borders that would allow empires to maintain absolute authority over their territories. They were fascinated by mapping – whether it was land or people – and they wanted to draw clear lines – as if humanity organized itself in clear, discreet groups. This pursuit was directly related to the spread of science and classification and the desire for everything to fit into a neat, functioning model–a working sum of all parts. In the European and Soviet empires, nations were often viewed as synonymous with ethnicity. In this model, nations were a tidy, self-contained package. In other words, a nation consisted of a “People” who wore certain styles of clothing, who ate certain kinds of food, and who lived in certain kinds of houses. In some cases, these national borders were created so that everyone could have their own homeland. And in other cases, they were created to split people apart and weaken their power. But equating nations with ethnicity would lead, in some cases, to purification campaigns—massive genocides to erase anyone who didn’t fit the national ethnic model. Afghanistan was comprised of hundreds of ethnic groups, and it would be impossible to successfully draw lines around them. More importantly, these groups intermixed and migrated and didn’t necessarily equate themselves with the national identity. We tend to focus on ethnicity using the Soviet model of nationality as if there are fixed groups and boundaries. And in Afghanistan they’re not, and that even if you’re a Pashtun, what if your mother is a Tajik? You have relatives that are Tajik. You can call upon them. And even a place that has two different ethnic groups as different as Hazaras and Pashtuns, if they’re from the same region, they may find that they have more in common with each other and cooperate more than they would with some co-ethnic from the other side of the country. These are our people. We know them, we know where they live. And so this concept of locality can often crosscut ethnicity. And so as Afghanistan has evolved, identities have also evolved, changing according to the perspective from which they are viewed and according to who they are viewed by. And that’s key. It depends a lot on the relationships that people have with other people. The concept, what we call ethnic identity, emerges when groups come into contact with each other and they begin to notice differences between what they are like and what other people are like. And different features of identity can become paramount, of paramount importance. They can be differences of language; they can be differences of clothing; hairstyle. Any number of different factors can become what people focus on as the critical differences between what we are, what we represent, what we’re like and what these other people are like. In the case of Afghanistan, boundaries between groups are often, historically often, been quite flexible and mobile. But at other times they become more fixed. And often when they have become fixed it’s because people have manipulated those differences in order to gain some kind of political advantage. Ethnic identity is something that has varied a lot historically, and has been one tool for political gain that’s been used, both by groups themselves and by the State. And yet in spite of this manipulation, Afghanistan has yet to see the kind of ethnic splintering that tore across other parts of the world, the most famous example being Yugoslavia—a multiethnic nation that fractured along ethnic lines. When one looks at all the ethnic groups in Afghanistan, one almost immediately assumes that there must be considerable ethnic conflict. But if this were the case one would have to ask why hasn’t Afghanistan fallen apart already? It’s had no centralized government for 20 years. It was a failed state and yet one of the most interesting things about Afghanistan is that no ethnic group has demanded for itself an independent country, or amalgamation with neighboring ethnic groups. I think what we need to look at in Afghanistan is that in Afghanistan ethnicity was never associated with nationalism. That is, the fact that you were an ethnic group did not immediately lead people to assume we must have our own nation. Another key point is that ethnicity in Afghanistan changes depending on perspective. One useful term for understanding this is the word kaum. It’s very easy in Afghanistan to talk about large ethnic groups, Pashtuns, Tajiks, Uzbeks, but actually inside Afghanistan people rarely identify with such large ethnic groups. They’re too large. They don’t have any meaning. But how one identifies ethnicity depends very much on context in Afghanistan. And the Afghans have a particular term that they use called kaum. And the nice thing about this term kaum is essentially it could be translated as our people, our group. If you want to say well what are the boundaries of our group? First of all, you have to ask well, what’s the problem that we’re discussing here? So a kaum could be a small village. That’s it, that’s our kaum. That’s not that other village. You know they’re not. But in conflicts with the next valley, everybody is a member of our kaum, all the way up to Tajik, to Uzbek. So what we find is like an onion, you peel it there’s layers, there’s layers, there’s layers, but the important thing is, and this is what makes ethnic maps quite problematic, is the question of whether this identity is useful or not depends upon the problem that’s at hand. Today, Afghanistan has an estimated population of 30 million people. But it has an infinite number of ethnicities depending on who you ask, when you ask, and why you ask. It would be mistaken to draw lines around these ever-changing identities. Colonizing powers were obsessed with the concept of nations. They tried to carve the world into clearly marked borders—as if humanity can be organized in clear, distinct ways.